Crime Clusterf@$k/Political Pantomime 22mts, 5dys: Make up or Break up??? Today the partnership meets....well except Daaga, he fell ill.
Will they make-up or break-up? Yesterday Ask Anil came out from his corner swinging away roughly at his leader, openly criticising Ramadhar on his position on Marlene Coudray and the mayorship of San Fernando. But last night on CNC News like the Prakash grow a big hairy pair. 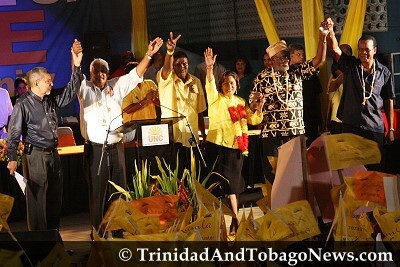 Flanked by the other remaining COP MPs - Carolyn Seepersad-Bachan, Winston Douglas and Roger Samuel - Prakash addressed Ask Anil's comments, pointed to the importance of the UNC keeping to its promises on the Fyzabad Accord. Now I have a question....of the remaining COP Members, three still hold ministerial portfolios: Ramadhar, Roberts and Dookeran......WHERE IS WINSTON? When last have we seen our Minister of Finance? He has been noticeably and conspicuously absent from Parliament. The talk is when Winston not in Trinidad he is in India....is he running his Ministry from India...he certainly isn't running his constituency, that much I can tell you because I can't see him for love nor money. What's his take on the current impasse? Especially since he was leader when Coudray became Mayor and the Fyzabad Accord was signed....the last time I hear anything was Dooks was a mumbled response to reporters that implied that Shoppin Toppin didn't really abuse the card because the created for the uses she put it too...thereafter he disappeared. So, if anyone knows where he is, give me directions. I have questions for my Minister of Finance! 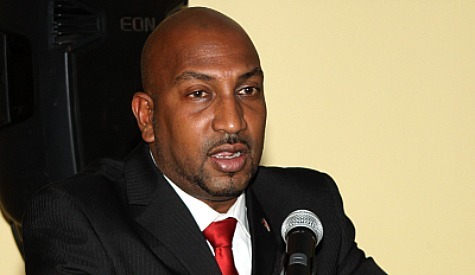 The big rumour circulating FB yesterday was Anil Robert's alleged defection from the COP for the UNC...no evidence yet to support the rumour; but many claim it won't surprise them since in their minds Anil has been UNC in everything but name since he received his ministerial portfolio in sport. One commenter on FB even calls him JAck Jr.....I thought that funny, but fitting. 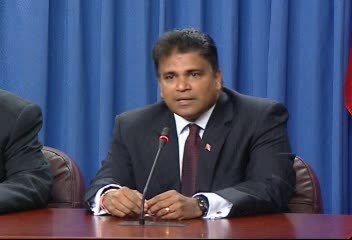 In yet another "The-PNM-Do -It-Too" finger pointing session, Roodal Moonilal - while answering questions about Shoppin Toppin's expenses and assuring the Parliament that the bill has indeed been paid off - under the protection of Parliamentary Privilege accused former HDC Managing Director of owing $500m on the Govt Travel card. Opposition Leader The Keith accused Moonilal of lying, indicated the conditions under which Garcia borrowed the money, and said the money has been paid off. 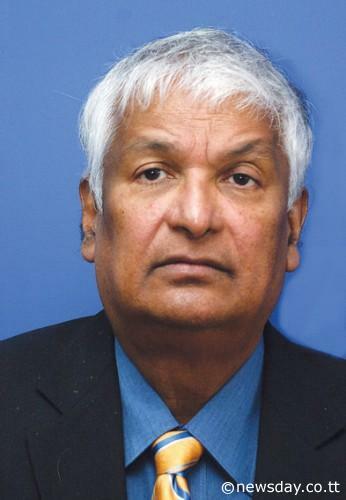 Now the thing is, Moonilal is the same person who came to Parliament at the height of the SoE and blamed scrap iron dealers from Beetham for being the masterminds behind the diesel bunkering, he also accused Beetham Residents of having built an underground bunker and having diesel, as well as guns and ammunitions stored in it. Thus far we have never seen a picture of this alleged bunker. It has turned out that any diesel bunkering taking place in Trinidad is certainly not taking place under a scrap iron yard in the Beetham. Moonilal, in essence used the protection of Parliament to lie on and falsely accuse an entire community with no evidence. In short....Moonilal does lie....so I find it hard to believe him on the Noel Garcia accusation and will wait and see if any more comes of the accusation. Further, the constant finger pointing at the PNM after the PP promised "new politics" is just disgusting really. And even further, I think all Govt Travel Cards should be cancelled. Let the MPs and Ministers use their own damn credit cards and put an end to this abuse of public funds. Because if it is true that Mr Garcia's son had an accident and was loaned the money by the Govt to assist him, that certainly isn't a facility that I, as a tax payer, am afforded if something were to happen to a loved one. I'd have to throw a barbecue or a cake sale to be able to afford health care! Not to be outdone, Herbert Volney jump on the Keith back too alleging that Keith likely to have another court case soon. Rowley spent some time denying that too. Economist Gregory McGuire is predicting a period of political instability...I think the period here long time! We need Midol! Tim Goopeesingh taking heat for some tendering procedures. A Diego Martin man and a Tabaquite youth. The Diego man brings the murder toll to 87, last year this time was 99...and the young boy was killed by a police bullet, and his parents claim it is a case of mistaken identity...since 2000 the Express' Gyasi Gonzales says, almost 300 people have been killed by the police. Folks, apparently to caribbeanaxis.com, the Government will soon be the major shareholder of One Caribbean Media and The Citadel group of Companies... This could mean that TV6, i95.5, Red 96.7 and their other subsidiaries will soon be government owned. However sources inside OCM are saying that there is no validity to this article. We will see. And for you online shoppers out there....zip codes coming soon. As per this Partnership mashing up...too much at stake folks. Kamla will give Prakash what he wants, Marlene will lose the Mayorship and gain something else....the ambition is strong in her, keep an eye. Is the Partnership going to mash up? No...is the Partnership in crisis...hell yeah, it flimsy as hell. they staying together to secure their position at the feeding trough. Prakash Ramadhar, in protecting his opportunity to eat ah food, will squander the trust of his membership. Prakash will ramajay himself, and attempt to project the idea and ideals of leadership; but he what he is seeking today is to secure not the party and its ideals, but his position in government. By the end of today Prakash and Kamla will emerge flushed, happy, triumphant, holding hands, rings back on fingers, declaring themselves stronger than ever.....wait for the big fete on May 24th.